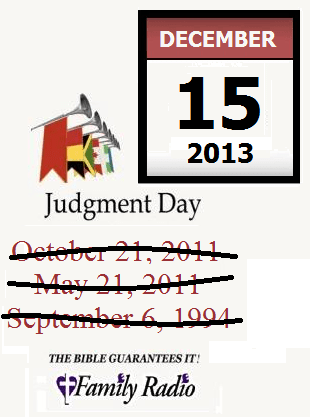 Evangelical broadcaster Harold Camping convinced followers that the world would end on September 6, 1994. As you may remember, it didn’t. Mr. Camping looked back at his Bible-derived math and recalculated; the Apocalypse would occur on May 21, 2011. Mercy me, wrong again. Back to the drawing board. 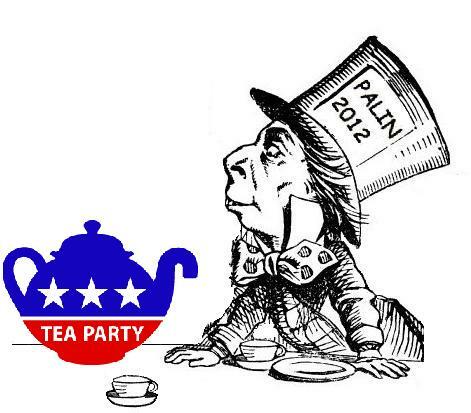 Okay, that’s it: October 21, 2011. Oops, third strike. It wasn’t a total loss, though. Mr. Camping was awarded the 2011 Ig Nobel Prize in Mathematics for his efforts. Doomsday finally arrived for Harold Camping, but the rest of the world didn’t go with him. He died last Sunday. Judgment Day. For Sure This Time. Probably. Could Be. 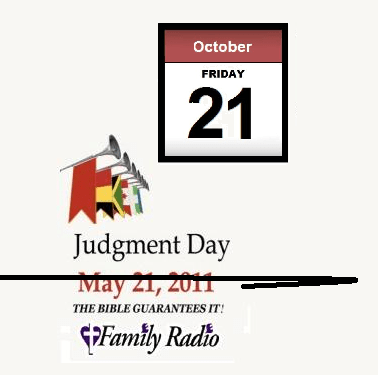 The Bible predicts that today, October 21, 2011, will be the End of Days, claims Christian broadcaster Harold Camping. Brother Camping also said that about May 21, 1988, September 6, 1994, and May 21, 2011. Today’s Forecast: fire, brimstone, plagues, dead sinners. The Righteous will fly upwards to Heaven but, due to the recession, they will fly Economy Class. The world ends on a Friday. How cruel. A merciful God would at least let us have the weekend. Actually, Mr. Camping is a bit more hesitant about today’s Rapture. He’s saying the world will “probably” end today. We’re waiting to hear the odds from Vegas. 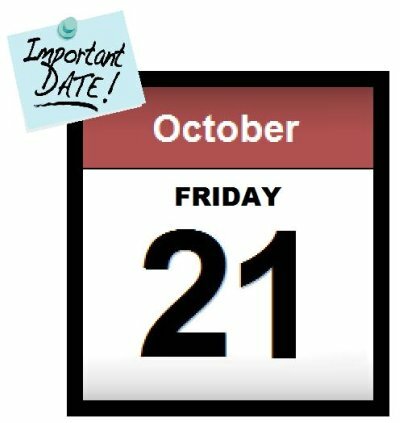 Apocalypse — Save the Date! 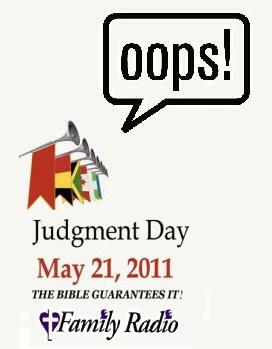 Notice: Due to unforseen circumstances, the End of the World has been rescheduled for October 21, 2011. We regret the inconvenience. Ticket holders for earlier doomsdays predicted by Howard Camping (May 21, 1988, September 7, 1994, May 21, 2011): tough. In case you missed it: Experts have determined that, despite the forecasts of evangelical prophet Harold Camping, the world has not ended. You can be sure that fundamentalist ranting has not, either. Today at 6:00 PM Eastern Time, the world is expected to end. Skeeter Davis (above) explains it all to you. Note: According to some, the world has already ended.